I had a hard time deciding which cookies to make this year. I have an abundance of recipes, and between Pinterest and my large collection of cookbooks, I felt a little overwhelmed. I wanted to pick recipes that were delicious of course, but also cookies that would be useful in case you are the type of person who likes to give cookies as gifts or furnish the cookie tray at holiday parties. And I wanted it to be something different that wouldn’t be in everyone’s gift or on everyone’s cookie tray. Which is how I stumbled upon this recipe. It’s adapted from Southern Living: 30 Years of Our Best Recipes , a cookbook I’ve had for years but have never cooked out of. 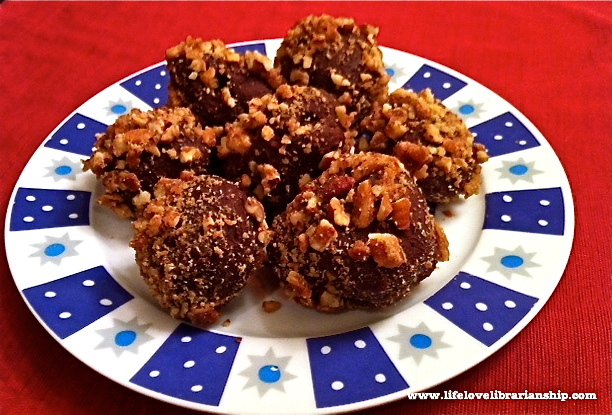 I’ve made truffles before, but I really liked the idea of these with the pralines. You can’t get much more southern than pralines at Christmas. Microwave chocolate and whipping cream in large, microwave-safe bowl for 1 minute on medium power. Stir, and continue to microwave in 15 second intervals at medium power until chocolate is melted and smooth. Whisk in butter and almond extract. Set aside to cool for 20 minutes. Using an electric mixer, beat cooled chocolate mixture 4 to 6 minutes or until soft peaks form. Cover and chill at least 4 hours. Shape chocolate into 1 inch balls (I got 24) and roll in Praline Pecans. Keep refrigerated for up to a week, or freeze for up to a month. Preheat oven to 350°. Grease a round cake pan (preferably 9 inches) with butter*. Stir together pecans, sugar, and cream. Spread evenly in prepared pan and bake for 10 minutes. Stir, and bake for another 10 minutes. Cool completely and stir in an airtight container. Previous post: The Cookies Are Coming! !